I have been craving leg of lamb for a month now. Something with rosemary and mustard. I didn’t really know what I was looking for, but Paul, never long without an idea, directed me to this recipe. He has made it twice and claimed it was the best he’s ever had! It certainly looked delicious and sounded like what I was looking for. So we invited friends, bought a beautiful leg of lamb, brought home several wines and then, of course, all things fell apart – dinner got canceled. Alas, we had another dinner party, and we just worked the leg of lamb into that! The result…..just perfect! The mustard and rosemary/thyme herb marinade melded beautifully with the very slight gaminess of the lamb. With this particular recipe, you want be careful not to overcook it, as you want to retain the juices from the meat. We cooked to an internal temperature of 143 degrees. One of the luxuries of owning a winery is that we pulled out 4 different wines to try with the lamb. The hands down winner was the 2006 Reserve Syrah. The 2006 Reserve Syrah is classic Northern-Rhone style, with hints of meatiness and earth, layered in deep fruit. 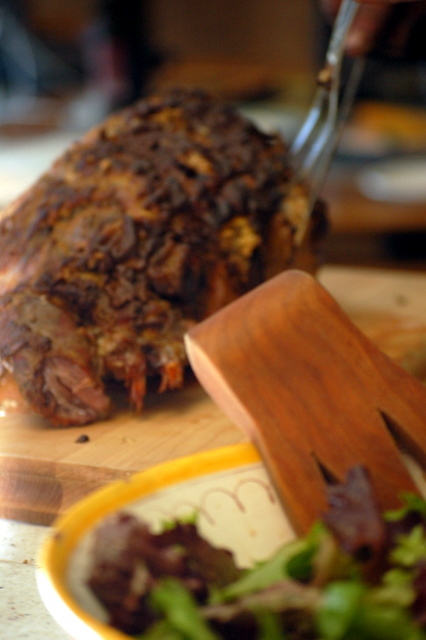 The texture is rich across the palate which compliments the texture of the lamb. We hope that you get the time to try this recipe! The preparation is simple, the flavors outstanding. Perfect to serve at table with friends! This entry was posted in Recipes - Featured and tagged featured recipes, recipe of the month, recipes. Bookmark the permalink.